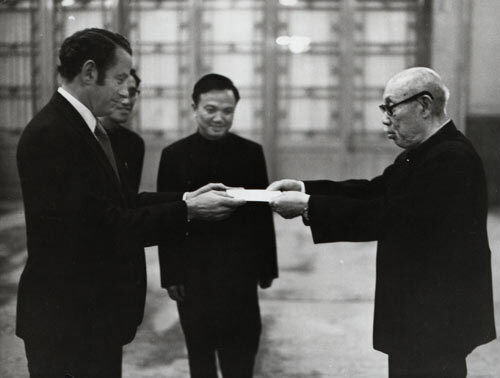 Bryce Harland (left), New Zealand's first ambassador to China, presents his credentials in Beijing, China, in 1973. Harland was responsible for establishing New Zealand's official presence in China and giving New Zealand a profile with the Chinese government. His US counterpart (later US president) George H. W. Bush described him as determined to try to extract as much US information on China as possible.